Hiya guys! Long time no polish. I have spent the last week and a half taking care of my dogs, two of whom ended up in the ER back to back (for different reasons). Needless to say, it's been a heck of the week and I'm exhausted. But there is no time to be tired when they are lonely polishes in the mani cave. 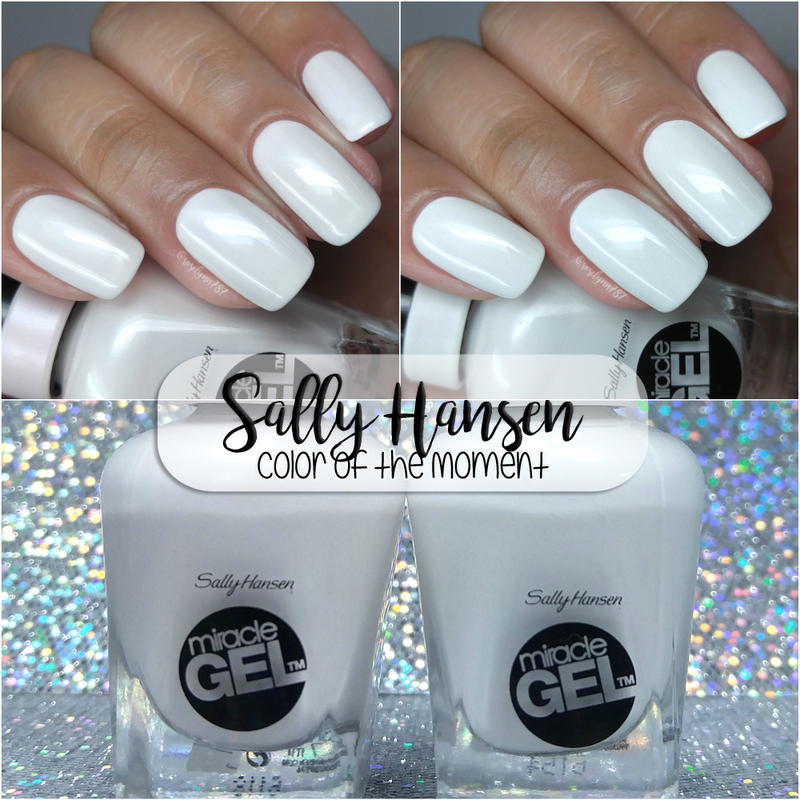 Today I'm sharing the Color of the Moment shades by Sally Hansen's Miracle Gel line from the month of May. I'm a bit behind due to these arriving a bit late to me, but also all my bad luck (i.e. camera breaking and dogs getting sick). Enough of all this jibble jabble, let's get to these gorgeous shades! If you're not familiar with the Miracle Gel line, then let me give you the quick rundown. The gel line does not need UV/LED light, it's two simple steps and you'll have a manicure lasting up to 14 days. The Sally Hansen Miracle Gel shades are now available for purchase at your local drug store like Walgreens, CVS, and Rite Aid. These retail for around $10, depending on the store and any current sales. Creme de la Creme can be described as a subtle pink sheen cream. Normally such a light pink doesn't really suit my skin tone, but there is just something about this one that I can't resist. The formula has a really nice opacity that is slightly sheer during the application. The consistency leans on the thin side, so you have to be careful not to overload the brush. It builds-up really nice and even with a high-shine finish on its own. Shown in two coats and sealed with the Miracle Gel topcoat. Get Mod can be described as a pure white cream. And if there is one thing a nail artist like me loves it's a nice clean canvas to work with! The formula has a sheer application, but the opacity builds-up really well. Consistency wise it's a bit on the thin side, but manageable enough not to run. It dries down to a high-shine finish on it's own that is intensified after topcoat. Shown in two to three coats and sealed with the Miracle Gel topcoat. And now time for some nail art, I'm feeling a bit rusty I can't lie. 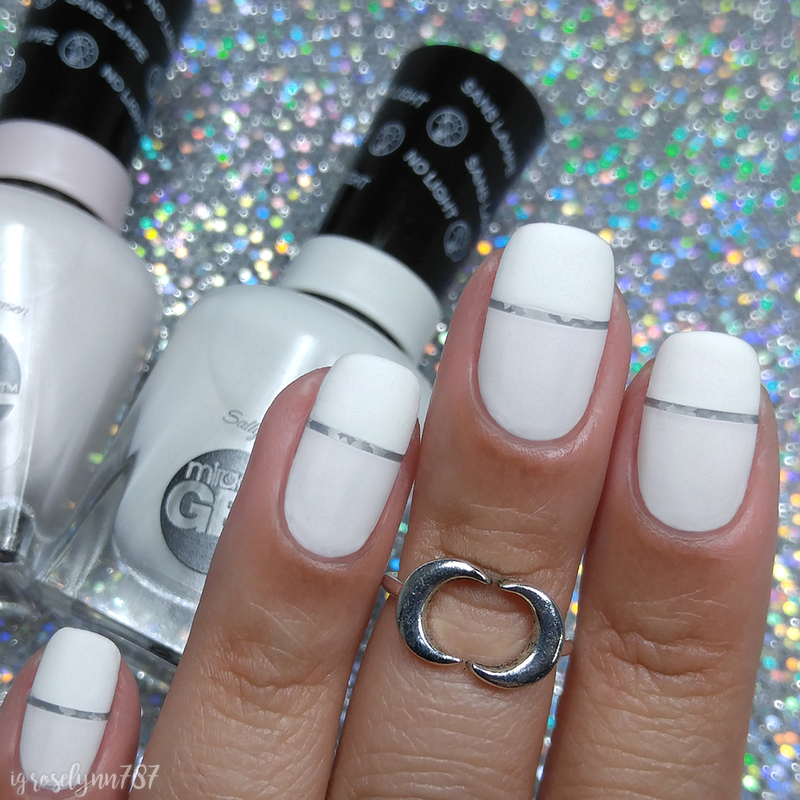 But I went for a simple and chic look using both shades and a little striping tape. I had to use a matte topcoat (used after the Miracle Gel topcoat for long lasting effects) and I think it turned out rather cute. It's totally giving me bridal vibes! Redux on to the Wedding Bliss segment anyone? What do you think? Overall I love both these shades, especially Creme de la Creme although it's very hard to distinguish the pink from the white in photos. It's a very subtle pink, but it's definitely much more noticeable in person. Even perhaps against another skin-tone. The Sally Hansen Miracle Gel shades are now available for purchase at your local drug store like Walgreens, CVS, and Rite Aid. Now for your chance to win these shades create your own Sally Hansen manicure and post it on Instagram and tag it with @Sally_Hansen, @roselynn787, and #ColoroftheMoment. Thank you for taking the extra step of doing the nail art. I could see NO difference between the two colors in the individual photos, but that nail art made it clear that one is a stark white and the other has a very (very!) 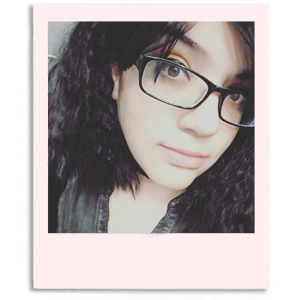 subtle pink tint. Agree with Aimee, I didn't see the difference til the nail art. These look beautiful, not streaky or anything like whites/lights can be.